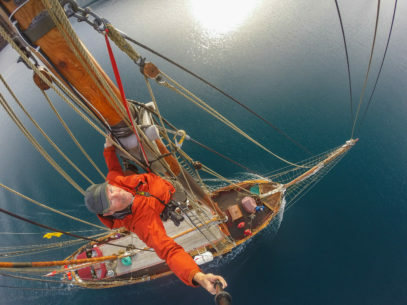 Sixty feet above the 100-year old sailing vessel 'Donna Wood' while sailing a spectacular fjord system in eastern Greenland. From this position, which I returned to frequently during our one week expedition, the view of the surrounding landscape and icebergs below is one I'll remember forever. Certainly not the spot for everyone since the rather suspect rope ladder must be climbed and descended unprotected.